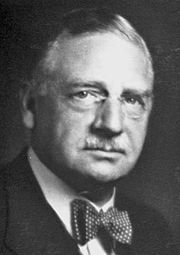 Otto Loewi was born in Frankfurt, Germany on June 3, 1873. His father Jacob was a Jewish wine merchant. He attended gymnasium school in Frankfrurt and then the Universities of Munich and Strasbourg as a medical student. Not really interested in clinical medicine, Loewi applied himself to physiology and pharmacology. He completed his thesis on the effects of arsenic, phosphorus, and other substances on an isolated frog heart. After completing his medical education in 1896, Loewi spent a year as an assistant doctor in a hospital in Frankfurt. There he was frustrated by the lack of effective treatment for tuberculosis and pneumonia patients. This convinced him that he did not want to practice clinical medicine and opted instead for a research career. He was able to get a position as an assistant to Hans Meyer starting work in Meyer's laboratory in Marburg in 1898. Working in Meyer's lab he researched metabolism. While working there he proved that animals were able to synthesize proteins from protein degradation products (amino acids). Before that it was believed that animals could only make proteins from other intact proteins. Other honors won by Loewi include honorary doctorates from the University of Graz, Yale University, University of New York (where he worked after he emigrated to the United States) and the University of Frankfurt. He was made an honorary member of the Physiological Society of London and a member of the Royal Society. Loewi died on December 25, 1961.